For proper hydration balance during the day and night and anywhere, the still Gorska water is the right choice. The natural ideal balance of minerals, salts, dietary minerals and low percentage of sodium enables you daily consummation of Gorska in unlimited quantities. For the consumers who know what is the best for their health, Gorska offers water with l-carnitine which significantly boosts the metabolism, dissolves body fat, increases the physical energy, and increases the resistance of the heart muscle and heart rate. The l-carnitine contained in Gorska Sport is produced in the renowned Swiss company for life-sciences – Lonza. Gorska sparkling water is an amazing mixture of bubbles with balanced structure for incredible refreshing. The combination of minerals and mineral salts guarantee the wellbeing of your vital functions, psychological and physical health. The combination of the most quality natural water Gorska and the taste of lemon shall supplement your refreshing experience. Gorska Lemon with its unique taste offers you fruity hydration and revitalization of your body and mind. Gorska Lemon is an excellent drink for every season and every occasion. Gorska has excellent solution for your family and for all those who keep account to drink around 2 litres of water per day, the quantity recommended by the experts. 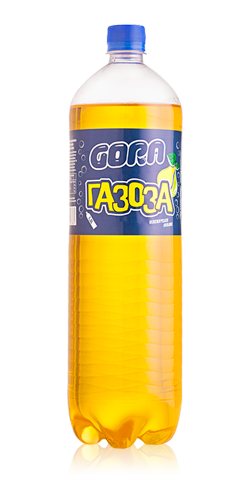 The most quality Gorska still water is available in ideal family packaging of 6 litres. This packaging is practical and easy to use. Gorska offers you packages which are ideal cost-efficient solution for water devices. Gorska is a leader in filling and distribution of water in non-returnable packages of 10l and returnable packages of 19l. Gorska has a special line of products in glass packaging indented for hotels, restaurants and cafes (HoReKa). 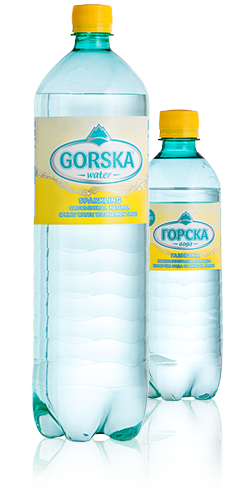 Gorska still and sparkling water keeps its most important feature - that is the water quality - in this modern packaging also. With its refined look and best chemical structure, Gorska water in glass packaging adds value in the catering industry. Gora soft drinks offer incredible fruity refreshing which contains vitamins, nutritional value and liquids necessary for maintenance of your hydration. Despite the fact that these soft drinks reduce the thirst, they also have superb taste because they are produced with the natural spring Gorska water. Gora soft drinks are filled in PET packages, namely family packaging and packaging ideal for the younger consumers with six irresistible flavours. Packages: Orange 0.5l, Orange 1l, Orange 1.5l, Peach 0.5l, Peach 1l, Peach 1.5l, Green apple 0.5l, Green apple 1.5l, Multi-vitamin 0.5l , Multi-vitamin 1.5l, Multi-red 0.5l, Multi-red 1.5l and ACE 1.5l. Irreplaceable part of the pallet of products from the Gora brand is the refreshing ice tea. These alcohol free soft drinks are made from herbal extracts without preservatives and the most quality Gorska water. You may find Gora ice teas in three flavours: lemon,peach and cranberry/wild fruit in small packaging of 0.5l and economical packaging of 1.5l. Despite soft drinks, Koding Company produces fizzy drinks known under the name Gora Cola and Gora Orange. 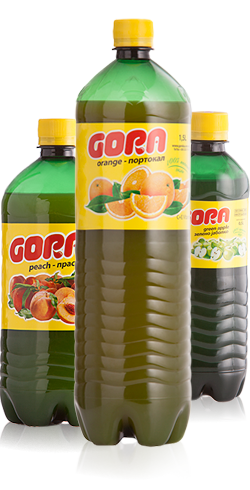 Gora refreshing fizzy alcohol free drinks are produced from the best Gorska water and herbal extracts (cola) and fruit base (orange) which are ideal refreshment in any occasion. New product in the range of Gora soft drinks. Refreshing, with a specific taste and aroma, produced with the best Gorska water and pear extract. 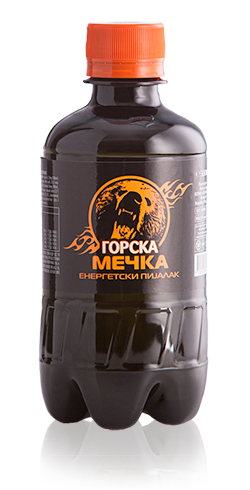 Available in PET packaging of 1,5 l.
Gorska Izotonik is a high quality sports drink, manufactured under a tested and controlled formula. Enriched with vitamins and minerals, this drink perfectly meets the needs of athletes and physically active joggers. Refreshing, low energy, non-carbonated and non-alcoholic drink made from lemon juice and grapefruit, ideal for consuming before, during and after physical activity, enables proper hydration, recovery and regeneration of energy and performance. 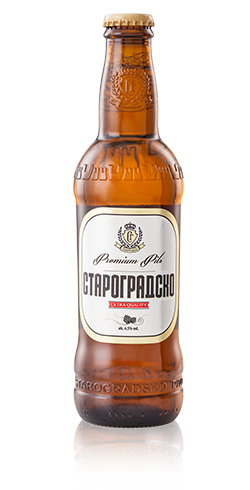 Try Starogradsko and let it astonish you with its unique taste, specific color of ripe wheat and rich and firm beer head. Prepared under a traditional German recipe, exclusively from hops, yeast, barley malt and Gorska water, this drink offers an unforgettable experience and a sense of freshness. In our cutting edge technology brewery, we have made the best quality, first and only beer on the Macedonian market which is unpasteurized and full of nutrients. Starogradsko. A moment of pure pleasure. Bottled in disposable premium 0,33 l packaging. 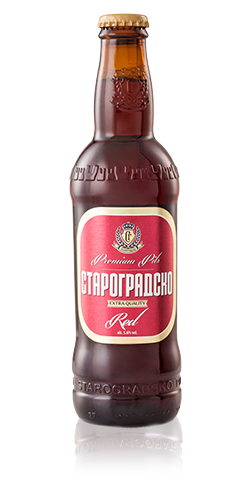 Starogradsko Red is the first red beer on the Macedonian market, made of special barley malt- BEST Red X malt, which is used exclusively for production of red beers, as well as hops and yeast combined with natural, spring Gorska water. This specific barley malt gives a unique red color to the beer. The taste is further enriched with unique caramel flavor. Starogradsko Red is high quality premium beer containing 5.6% alcohol and it comes in 0,33 disposable glass packaging. 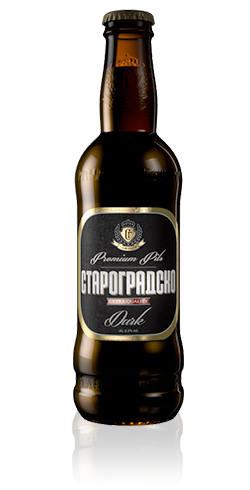 Starogradsko Dark is the only unpasteurized, cold-filtered beer from Macedonia. True beer enthusiasts will immediately recognize the authentic and rich flavor, aroma and the premium quality of Starogradsko Dark. What is characteristic for this beer is its strong creamy beer head, which lasts until the last sip of beer. The specific dark color and the intense flavor, its coffee and chocolate aroma that characterize Starogradsko Dark, result from the fact that it is produced from a special kind of double roasted barley malt. Its uniqueness results from the high-quality ingredients and the specific process of production of unpasteurized beer. Starogradsko Dark is manufactured according to a German recipe, exclusively with natural ingredients. Starogradsko Dark contains 6.5% alcohol and can be found in glass packaging of 0.33, disposable packaging.